bond with her horse Georgia, and was willing to risk just about everything to see her horse protected and free from her violent ex-husband. 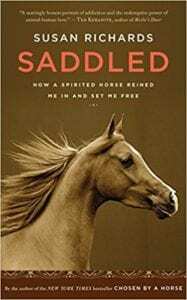 In Saddled, author Richards details life with an abusive, alcoholic husband, her own battle with alcoholism, and how spending time with her cocky, opinionated, spirited horse was her only true refuge. The reader is given a glimpse into a life full of beer bottles, waking up with hangovers, and falling out-of-love. While Richards struggles with this once briefly idyllic life turned topsy-turvy by alcohol, the reader is drawn into what it was like living on a peaceful farm in the Adirondack mountains of New York in a loveless marriage. Richards moves from her marriage, to her divorce, to struggling to live on her own and finally building a new life. She is painfully honest about her mistakes and her own faults. To help understand how a woman who seemed to have it all ended up with almost nothing, the book moves between the late 1970s and Richard's childhood where, after losing her mother to leukemia and father to a bottle, she was bounced around between relatives who didn’t want her and weren’t shy about making those feelings known. It is no wonder Richards felt lost and unloved. While other people may have simply given up and found solace in alcohol, Richards had, during her brief marriage, admitted her drinking problem and swore to drink no more. It was a struggle, certainly, but the knowledge of being needed by her horse kept her moving forward. When she left the Adirondack farm for good - due to her knife wielding husband – there was no way to retrieve her beloved horse. And so she fought, and accumulated lawyer bills, until Georgia was returned to her. Throughout each new struggle Richards faced, it was always the love from her horse that kept her going. I was drawn into Saddled from the very first page. Perhaps it is because, like the author, I’m “owned” by several horses and can relate to her incredible attachment to these amazing animals. She describes her interactions with Georgia in a funny and engaging way, and as a woman who has a true sense of the equine mind. But beyond that, the author has a very easy writing style, somewhat self-deprecating, and frequently humorous. It kept the story flowing and, although the topic is quite somber, I never felt dampened or discouraged by the sad story. In fact, I had quite the opposite reaction. I found Saddled to be uplifting and enjoyable. Quill says: Whether you’re an animal lover, or simply a lover of a good memoir, Saddled is likely to draw you in and keep you reading until the very last page.